Newport County midfielder Michael Flynn says he is hoping he can change manager Justin Edinburgh's mind about releasing him at the end of the season. County confirmed in February that Flynn and David Pipe would be not be offered new contracts. Pipe has now left but Flynn claims Edinburgh has said he can change his mind and earn himself a new deal. "You will have to ask him, he has said I can maybe change his mind," said Flynn. "But for me, it has not changed anything, I will give 100 percent for any team I play for, especially Newport County because it's in my heart and I'm a hometown boy. "Hopefully, I can change his mind and we will go from there." Edinburgh admits he is having second thoughts about releasing midfielder Flynn this summer. Flynn, the 33-year-old former Wigan and Blackpool player, returned to Newport for a third spell in July 2012. Edinburgh stated in February that Flynn and Pipe would not be offered new contracts when their current deals end in the summer. 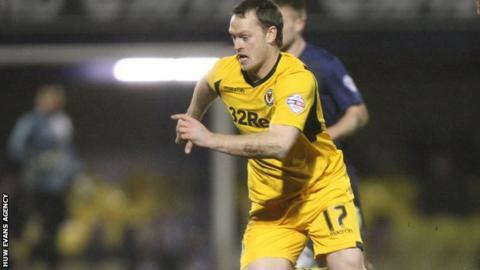 Pipe has left the Exiles after coming to an agreement to end his contract with the League Two club. Flynn has been a permanent fixture in the County side since March and has impressed with his recent performances. He reveals he has not began looking for a new club and says his primary focus is on performing well for Newport until the end of the campaign. "I haven't looked at all yet," said Flynn. "There is no point because no club is going to sign you in May. "They don't want to pay the wages and a lot of teams don't know what division they are going to be in yet. "I have been around long enough and I will just try and enjoy the summer and see what happens. "Hopefully, something will get sorted here, but that's not my decision."